Keratoconjunctivitis sicca, commonly referred to as dry eye, describes the changes in the cornea and conjunctiva which result from a tear deficiency. 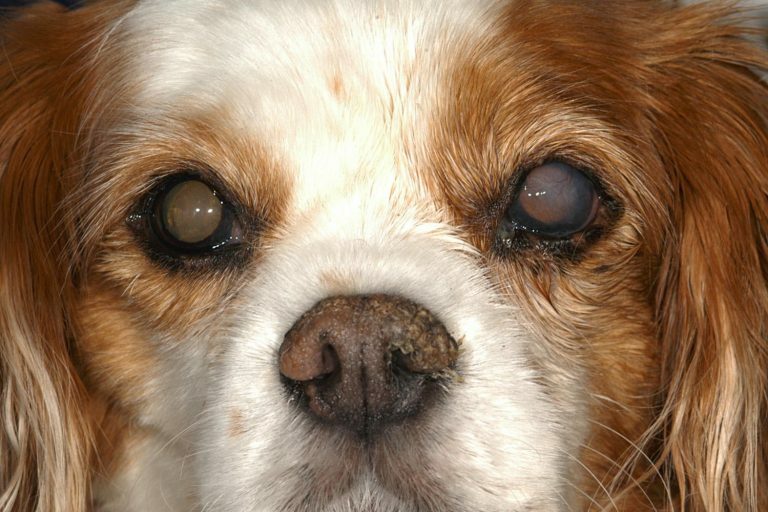 Below is information about this disease and treatment tips for keratoconjunctivitis sicca (KCS) in dogs. The tear film has three layers. The outer most layer is an oily layer supplied by the meibomian glands and it helps to prevent evaporation. The middle layer is the aqueous layer produced by the lacrimal gland. The innermost layer is in direct contact with the cornea and is a mucin layer produced by glands located in the conjunctiva. The mucus layer helps the tear film remain attached to the cornea. A quantitative KCS is a decrease, or lack of, production of the aqueous layer of the tear film. Qualitative tear deficiency is a decrease in the mucin or oily layers. Either type of KCS results in dryness of the corneal surface which can lead to corneal scarring and ulceration. Quantitative dry eye is diagnosed by performing a Schirmer tear test (STT). For many decades tear production in dogs had been considered normal over 15mm/min, but most recent studies have shown most dogs in the mid to high 20’s. The most common cause of KCS is immune mediated inflammation of the lacrimal gland. Other causes are congenital alacrima, drug toxicity from sulfonamides or etodolac, neurogenic loss of parasympathetic tone, third eyelid excision and metabolic diseases (diabetes mellitus, hypothyroidism, canine distemper). Tear break up time (TBUT) is used to diagnose Qualitative tear deficiency and it should be greater than 20 seconds. The treatment for either quantitative or qualitative KCS is lifelong topical ophthalmic immunomodulating and tear stimulating agents such as Tacrolimus or Cyclosporine. These medications are used to increase natural tear production while decreasing inflammation and controlling the immune response at the level of both the lacrimal glands as well as the cornea and conjunctiva. Cyclosporine is FDA approved and commercially available as Optimmune (0.2% cyclosporine) or it can be compounded in oil as 1 or 2%. Figure 1. Dog with KCS pre-treatment with tacrolimus. Figure 2. Dog with KCS post-treatment with tacrolimus. Tacrolimus is compounded either as an ointment or in an aqueous or an oil base as 0.02%. Sometimes higher Tacrolimus concentrations are recommended if the KCS is non responsive. It can take up to 8 weeks for either Tacrolimus or Cyclosporine to increase tear production. Treatment efficacy is best evaluated by a decrease in the clinical signs of blepharospasm, conjunctival hyperemia, mucoid ocular discharge, corneal scarring, and corneal ulceration. 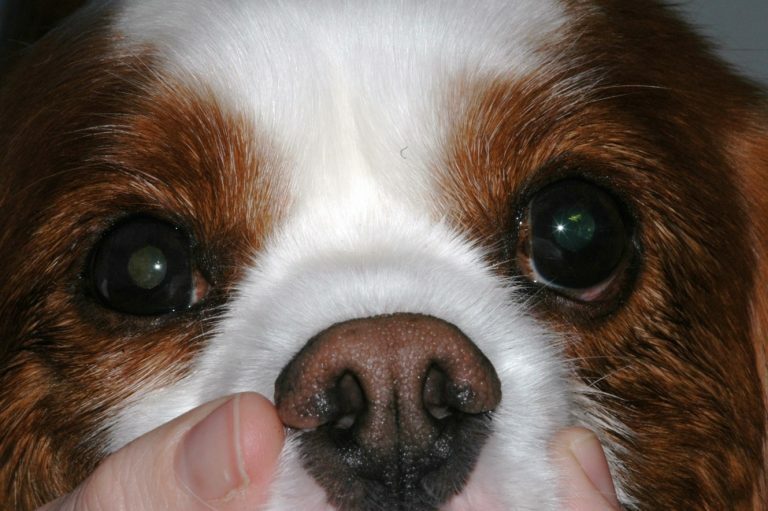 For dogs that do not respond to medical therapy there are surgical options for KCS including a parotid duct transposition, buccal mucosal grafting and episcleral cyclosporine implantation. Currently MedVet Columbus is participating in a KCS clinical trial for a novel quantitative dry eye therapy. For more information please visit our clinical trial website at www.medvetforpets.com/clinical-studies/. Participation in clinical studies, a collaborative environment, appointment availability, and a highly trained Anesthesia department with a team of board certified anesthesiologists, sets MedVet Ophthalmology apart from other ophthalmic private practices.